As a spate of tornadoes continues to pummel much of the Midwest, cable news outlets have begun to closely monitor the unfolding disasters of the past few days with alarming alacrity. Broadcast technology now allows live feeds to cover potential funnel clouds forming as though we were watching a car chase, and dayside cable shows are all too eager to cut in with the developing stories. But as is so often the case, East Coast-based media outlets fail to understand the larger context; the threat of tornadoes for those who live in the Midwest isn’t just a series of breaking stories, but more of a way of life. First of all, nearly all news outlets have done a laudable job of connecting TV viewers with many heart-wrenching stories in Joplin, Oklahoma, and in Tuscaloosa last month. But with those stories so close in our rear view mirrors, news directors appear, now, to be engaged in their own form of storm chasing, which in turn, has revealed that key lack of understanding about how ubiquitous tornado warnings are this time of year. It also reveals some regional differences between the decision makers at NY based cable news networks, and the character of the proud Midwestern people who regularly endure these storms. 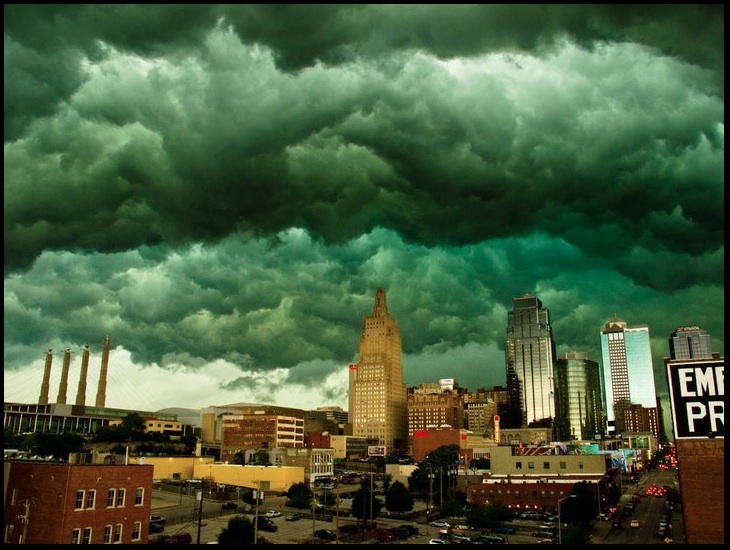 I was mostly raised in the heart of “tornado alley” in Hutchinson, Kansas, a smallish city of about 40,000 people that’s just a half-hour outside of Wichita. 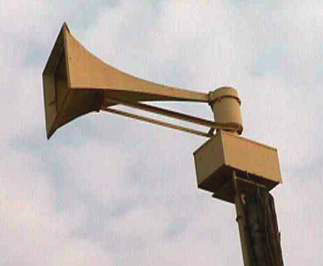 It just so happened that the alert siren – the actual yellow device pictured above – stood at the end of the block where we lived, so as a little boy, I was terrified by its portentous blare (not just during the time of a tornado warning, but also the first Tuesday of every month, when the sirens were tested). Have you ever heard a tornado siren? Its like an air raid drill; but the flat Midwestern landscape (combined with a sparse population and lack of buildings) seem to only amplify the frightening and thundering blare. It seemed to me that tornado sirens were designed with one goal in mind: to cause panic. For me, it always worked, like a terrifying charm. So as a kid I got quite used to running down to basement with my family, and riding out the storm, after hearing the siren sound of tornado alerts that too-often marked the late spring and early summer tornado season. My parents always remained calm, and I’m not sure in hindsight if they really weren’t bothered by the alarm, or just putting on an act as comfort to their nonplussed kids. I like to think the former, and as I got older, I saw that same sort of acceptance of the weather in everyone around me, including myself. Living in the Midwest, you eventually get used to this. And that’s the point. You hear it enough and understand that it serves a valuable purpose – it may save your life. But the constant blaring also serves as an excellent reminder that at any given time, a tornado could sweep through your neighborhood and render it rubble within scant seconds. The knowledge of living on that existential edge develops a character that, frankly, is what makes Midwestern people so unique. Yes, those in the Midwest often hold traditional values dear, and I am not speaking strictly about politics, but about old school characteristics like valuing education, hard work, and saving money. Talk to most people from the Great Plains, and they will tell you that these have long been hallmarks of Midwestern character. They form a foundation that can’t be ripped away by a capricious funnel cloud. Which flies in stark relief compared to the anxious and alarming tone that we are now seeing in live shots of impending storms. Yes, the past few days and weeks have seen awful devastation, the likes of which I haven’t personally witnessed ever before. But the current tone of impending doom reveals that the New York based anchors don’t understand that the threat of tornadoes is simply a way of life. In many ways, it’s the classic news media pitfall: overreacting to a recent news event with out of proportion coverage of what may come (and very rarely does). In some cases an alarming tone is an appropriate one, and after dozens of deaths, there’s an argument to be made that this is one such case. Like that siren, though, once the blaring coverage winds down to a low hum, then silence, life will go on in Tornado Alley, and so will that uneasy peace with its temperamental climate.